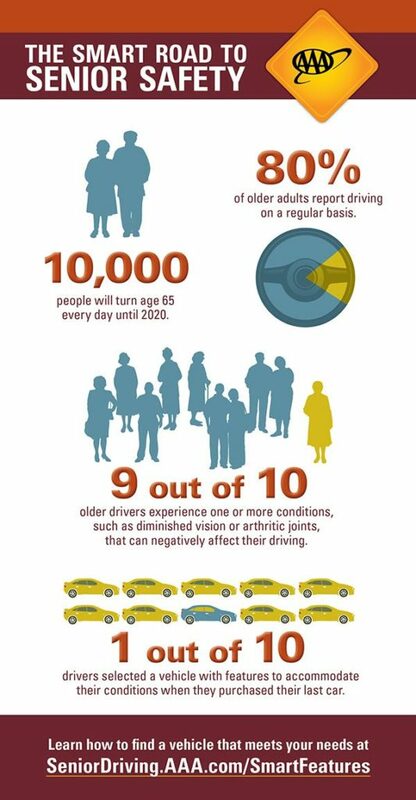 During Older Driver Safety Awareness Week, consider what physical challenges can be compensated for by utilizing equipment, adding to a driver’s safety and confidence. If neck turning is limited or painful, a wide-angle mirror may offer a solution. If foot pedals are harder to manage when diabetic changes have resulted in partial amputation, hand controls can offer a safe alternative. Swing-out seat: A replacement seat with a swivel base that extends the seat beyond the car threshold so drivers don’t have to maneuver around the steering column to get in and out. Tire pressure sensors: Electronic sensors that let the driver know when air pressure is low, which can help prevent a flat tire from a slow leak or loss of vehicular control due to under-inflation. Traction control sensors: Add-ons to an antilock brake system that can improve traction when the driver is accelerating too quickly or on a wet surface. Back-up camera: A wireless system that projects the view from the rear of the car onto an LED screen that can be mounted on the dashboard or windshield so the driver doesn’t have to turn around to see what is behind the vehicle. Seat cushions: Round swivel seat cushions turn 360 degrees to help drivers and passengers rotate in and out of the vehicle. Other types of cushions can help relieve back pain. Safety alert: Any cushion may also pose a safety risk. The cushion placed on the driver’s seat could compress in the event of a crash, creating space that allows the driver to slip forward under the now loose seatbelt. Older drivers experiencing physical challenges can work with driver rehabilitation specialists certified through the American Occupational Therapy Association or the Association for Driver Rehabilitation Specialists. They can do an assessment and recommend individualized adaptations, as well as teach drivers how to use recommended devices.